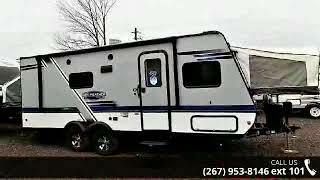 Hi, I am interested in your 2018 JAYCO Jay Feather (stock #13229) listed on Autotrader for $20,888. I'd like to get more information about this vehicle and confirm its availability. This unit includes Jaycos Customer Value Pkg., sink cover/dryer rack, LED TV, A/C, 15K BTU roof mounted, fantastic fan, electric tongue jack, enclosed underbelly w/astfl insul & aluminum rims. The X23B Jay Feather expandable by Jayco features a u-shaped dinette, single slide, plus front and rear beds.As you enter the X23B, to the right is a u-shaped dinette with overhead cabinets. A sofa slide on the road side provides additional floor space in the living/kitchen area. A refrigerator is next to the sofa and across from the kitchen amenities. The other side of the expandable features a pantry, kitchen sink, three burner range, microwave, overhead cabinets, and a TV.The rear bath includes a sink, corner shower, and a toilet.The front bed includes an overhead storage with with a curtain between the bed and living/kitchen area. The rear bed also has overhead storage and with a curtain between too. There are two wardrobes next to the rear bed and across from the bath.Dont forget the outside storage compartments for your outdoor camping gear, plus much much more!